Action Alert, News, and Research! Recently, CPS made mid year, school level budget cuts, totalling $46M. To see how your school was impacted, please go here. There are a few things happening on Monday, February 13, due to these cuts. 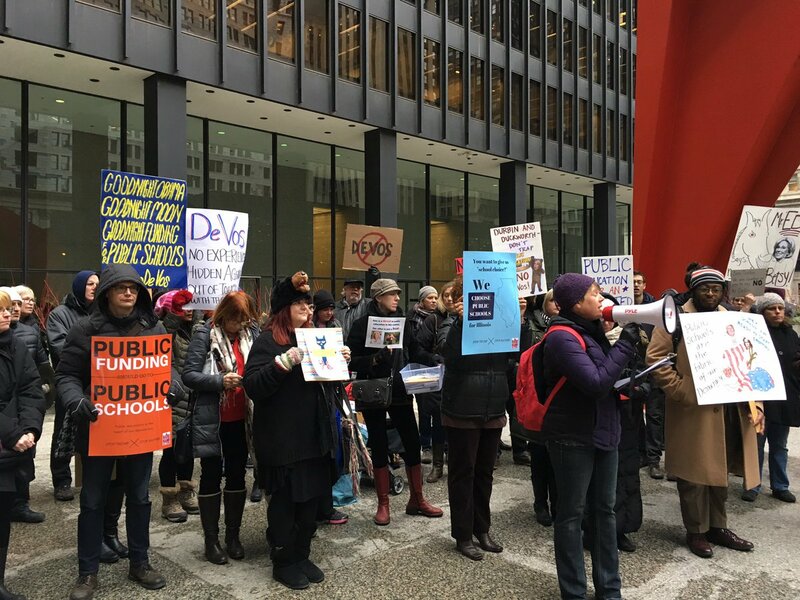 On Tuesday, January 31, we delivered hundreds of letters from Illinois parents and community members to the offices of Senators Durbin and Duckworth. Before the delivery, we hosted a press conference and a rally. Our message was clear: Just vote no! Thank you to our volunteer parents who planned our wonderful forum and who prepared these excellent handouts and advocacy tools! Thanks, too, to all of the parents, teachers, and principals who joined us tonight. We will post a link to this page in our Special Education Toolkit for Parents which you can find here. We were live tweeting as were a few others. See the Storify of the event here. ***In preparing for our November 16, 2017 Special Education in CPS Public Forum (more info on that here) we noticed that 2 links below are broken. You can find File D here and File E here. These documents as well as the ones below will be updated and distributed at our upcoming forum. We will post them on our website when they are ready. Illinois State Board of Education (ISBE) is doing more listening tour dates on the Every Student Succeeds Act (ESSA) which will replace Race to the Top which replaced No Child Left Behind. Thanks to the RYH Special Education committee for putting this letter together for parents to send to principals before the start of school. We hope to have this translated into Spanish in the next week. Below are notes from Joy Clendenning. She attended the CEFTF Master Planning Committee Meeting on July 14, 2016. She includes perspective on the 10 Year Educational Facilities Master Plan as well as information on how you can provide feedback.